Valmar International is a Management Consultancy established in the Year 2000 As part of our Vision to ASPIRE for Excellence, motivate and collaborate with others whom we associate with, we offer several learning programs ranging from communication skills, interpersonal skills, managerial skills, team building skills, influencing skills right through to Managing Cultural Diversity through Cross Cultural Sensitization, Global Business Etiquette and Emotionally Intelligent Team Management and EQ Leadership skills. Dexter Valles is the CEO and Managing Consultant and is a Certified EQ Practitioner, Assessor and Consultant by World Leaders in EQ - Six Seconds, California, USA. The EQ Legion of India (formerly Six Seconds India) which focuses on developing the Emotional Intelligence Quotient (EQ) in personal and professional lives of people. Established in 2010 as Six Seconds India, played host to Eight Seasons of EQ Certification workshops of Six Seconds, the world leader in Applied EQ, based in California, USA. 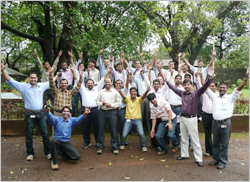 With over 100 Certified EQ Practitioners and Assessors in the network, VALMAR's EQ Legion of India takes this mission forward with local solutions and workshops for transforming lives by "Engaging Emotional Energy Everyday"
Corporate Training programs are designed and offered to major Indian Corporates & MNCs, with a practical view to developing competent and successful professionals at the cutting edge of business. With an array of Performance Enhancing Programs (PEP) we could say that Valmar International adds quite a bit of PEP to your business. We look forward for your call ! 2009 © Valmar International. All rights reserved.